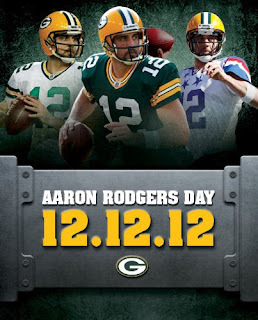 Ginger Duck in Orange Sauce: Blogmas Day 12: Aaron Rodgers Day! Some of you may know that when it comes to professional football I cheer for the Green Bay Packers. Now I know you are thinking that I should cheer for the Panthers right? Well, my first introduction to professional football was my next door neighbors growing up. They both were HUGE Packers fans and therefore I thought that was the team everyone was suppose to cheer for. If you are a Packers fan, you know that today has been named Aaron Rodgers day because today is 12/12/12 and Aaron Rodgers number is .....you guessed it twelve! In other news, I am officially back home :) ....and it feels wonderful. All I have to do now is unpack.